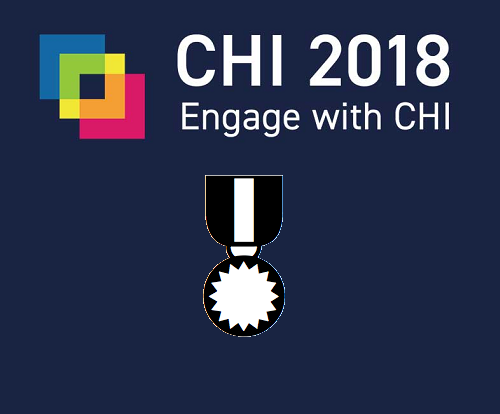 KUAR- Design Lab has realized yet another outstanding achievement with the announcement of the CHI 2018 conference. Our research fellow Oğuz Turan Buruk, in his article Extracting Design Guidelines for Wearables and Movement in Tabletop Role-Playing Games via a Research Through Design Process, nominated to the SIGCHI “Best of CHI” Honorable Mention. The CHI Associate Chairs nominated 5% of the exceptional submissions to SIGCHI sponsored conferences are received Honorable Mention. Researchers from Design Lab have presented three extended abstracts which are successfully accepted in the ACM 2018 CHI Conference on Human Factors in Computing Systems Extended Abstracts. The first extended abstract, “Snowflakes: A Design Speculation for a Modular Prototyping Tool for Rapidly Designing Smart Wearables” by Selin İnsel ,Oğuz Turan Buruk, Mehmet Cengiz Onbaşlı, Oğuzhan Özcan. Second one, “GROW: A Smart Bottle that Uses its Surface as an Ambient Display to Motivate Daily Water Intake” by Gül Kaner, Salih Berk Dinçer, Hüseyin Uğur Genç, Deniz Erdoğan, Aykut Coşkun. And the third, “Emotionscape: Mediating Spatial Experience for Emotion Awareness and Sharing” by Sinem Şemsioğlu, Yağmur Gökçe, Asım Evren Yantaç. The ACM CHI Conference on Human Factors in Computing Systems is the premier international conference of Human-Computer Interaction. This conference stands at the first place in Google Scholar Metrics on Human-Computer Interaction area with h5-index:83, h5-median:122 and acceptance rate: %23. We congratulate our all students for their extraordinary affords on their research!